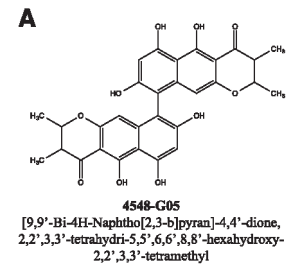 A note of caution: chaetochromin A has a polyphenolic structure. Anything with a lot of benzene rings and â€“OHâ€™s qualifies as a polyphenol (see below), and respected drug discovery blogger Derek Lowe says compounds with polyphenol structures are notorious for misleading and annoying medicinal chemists. However, Ye and his collaborators have biochemistry data showing that their molecule is binding specifically to the insulin receptor. This suggests thatÂ medicinal chemists can get to work tweaking.